With the flurry of recent activity for the booting sax instrumental, particularly that of Paul Williams, it’s only natural that Savoy Records looked around the studio and picked out the man blowing the tenor sax alongside Williams and enlisted him to cut sides of his own in a similar style in an attempt to strike gold twice. We know this type of thing NEVER works. So of course in this case, in the long run at least, it actually did. Bill Moore, who’d soon have the moniker “Wild Bill” slapped on his records just to be sure you knew what line of work he was now in, was a man in the right place at the right time. Signed to Savoy on the strength of his horn work for Helen Humes on “Ee-Baba-Leba” he hadn’t really been given much to do yet. He’d cut his debut back in July but it elicited no interest and his other sides from that session consequently remained on the shelf. Horn players at the time seemed destined to remain in the background unless they were dedicated jazz hepcats who could build solid reputations even if they didn’t sell a ton of records, but for Moore – who wasn’t a bop-legend in the making – his lack of returns on his early solo ventures meant he was shaping up to be little more than an anonymous sessionist earning 42 dollars a side, avoiding any blame if someone else’s record he played on bombed but also earning no glory should it wind up making waves. But then another sax player in the label’s growing arsenal of honkers, Paul Williams, stepped out on his own and promptly sent the rock instrumental into commercial orbit in October with Hastings Street Bounce, which was just starting to appear on Cash Box’s territorial charts as they were brought back into the studio on November 21st for a follow-up session. Hmmm, let’s see… they both play saxophones… Williams is already on his way to earning back our investment in him with this kind of noise… If one sax player is making money with this style then having two able to do so would be better… It doesn’t really matter what name adorns the label… ah, what the heck… Oh Bill… err “Wild Bill” that is… guess what you’ll be cutting today! In truth it probably had even less forethought than that. Back in October, after “Bounce” had been released, Moore had sat in with Williams on a first run through this same exact song. However the results apparently weren’t quite up to snuff and so it wasn’t released. Or maybe it was fine and Savoy Records just decided that other Williams tracks held more promise and were holding it back for use later on. But when the aforementioned Hastings Street Bounce showed up in Chicago’s hot sellers in November (and a week later landed on New York’s listings as well) somebody figured they could simply use it in some form or fashion to get Moore’s career off the ground as a bandleader in the process. Furthermore with a month to think the song over maybe they could even improve upon the results with a minimum of time and effort, maybe they shifted the focus of the arrangement to Moore here, maybe not. 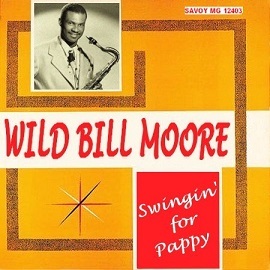 Either way it was now Moore – with Williams along for the ride – featured on the rather awkwardly titled Swingin’ For Pappy, taking his first shot at the growing jackpot in the rock ‘n’ roll sweepstakes. It starts off strong with Reetham Mallett’s snare intro (by the way, if that’s his real name, what better surname for a drummer than “Mallett”?) followed by Moore confidently honking his way off the starting line before Floyd Taylor’s piano buttresses the arrangement and they’re joined by Williams and trumpeter Phil Guilbeau to fatten up the sound. The first thirty seconds everything seems well thought out, orderly yet still exciting, everyone working together to head for a destination all have in their sights. When Williams, not Moore, takes the first solo on baritone though it begins to wander. Not only does the pace slacken but the melody shifts until it starts to feel like a different song altogether. When Moore jumps back in to liven things up it only becomes more chaotic not more exuberant, the three horns (don’t forget the trumpet) now almost competing with one another rather than spurring each other on. Nobody is playing anything to compliment the others, there’s no spaces left for each one to take, no sense that anyone involved is remotely aware of an arrangement and perhaps don’t even realize this is being recorded for commercial purposes by the sound of it! The playing only becomes even more whimsical as it goes along and comes dangerously close at times to going off the rails entirely. And yet… and YET… it’s still reasonably doing what it set out to do, or at least what they all believe they’re being called on to do in these early days when the ground rules of just what was required for such ostentatious displays hadn’t quite been figured out completely. But what they all do know for sure is that what they’re laying down now is plenty frantic which was their main goal heading in, and thus it’ll get your heart racing if you’re out on the floor trying to dance fast enough to keep up. The problem isn’t the concept itself, but rather that the proper dance floor for such a wild display isn’t hardwood, but rather ice. The musicians themselves seem to be slip sliding all over the place anyway so it couldn’t hurt if the patrons were too. They’re all out of control by the end, band and crowd alike, but if that was indeed the intent for everyone involved from the get-go then can they really be criticized for following through on it? Well, yes, in a way they can. As we’ve seen with Earl Bostic, and will see with others including both Moore and Williams in the future, there’s a right way to act manic, one with a better constructed game plan that enables the song to retain structure and build properly all while appearing on the surface to be completely undisciplined. They just haven’t learned that yet. The type of frenzied, honking, squealing workout the early rock instrumentals embodied often got criticized for being all style over substance, and worse still, unmusical gibberish. Yet the difference between the ones which worked so well and those which only worked well enough to keep your cardiovascular system pumping are actually rather easy to pinpoint. The latter songs, the ones that just miss their mark, like Swingin’ For Pappy, have the right idea and skilled enough players to pull it off but they’re lacking a coherent framework. It’s as if they think that sketching it out in advance and working out the kinks will dilute the enthusiasm they’re attempting to convey. They’re akin to Robin Williams stand up routines in that way – comedy that careens recklessly all over the map leaving you laughing at times, but often completely lost and in the end feeling utterly wrung out while being unable to remember a single joke. You enjoy it enough as it’s going along especially if you’re in the right frame of mind for it (and that goes for comedy and music both), but when it’s over and the pandemonium dies down and you look back on it as you catch your breath and head for the exits the end result winds up considerably less impressive than the sum of the parts. The right components are all present and accounted for here. Moore has the lungs and the commitment to blow up a storm, but not quite the discipline or experience in doing so yet to reign it in enough so it makes sense to the listener. In order to really pull it together in the future the songs will need to be tightened up without losing their enthusiasm in the process and before they start to blow they need to understand full-well where they’re all headed, what roads they’re taking to get there, and just which one will handle which curves along the way. Like anything it takes practice – appearing to be a lunatic (spontaneous or not) while remaining in control of your actions is harder than it would seem. But for a first try it’s really not bad. They don’t get anywhere, true, but like a kid behind the wheel of a car for the first time they’re mostly going in circles much too fast and if you’re a listener – or a passenger – you’re just happy when the wheels stop spinning, they turn the engine off and you’re safely out the door and back on solid ground in one piece. Leave a reply on "Wild Bill Moore: “Swingin’ For Pappy”"